Daman & Diu is known for their beaches and exotic liquors, these twin islands are a tourist's haven for escaping the cacophony of mundane life. Be it the rich historic past or the faint songs of the anglers, everything in Daman and Diu assist in creating a paradise for one in search of tranquility. The forts and churches of the past, and the pubs of today, combine to engender a strange ambience of nostalgia and experience. Daman and Diu lie on the edge of the southern borders of Gujarat, which is situated in western India. The northern side of the isolated island, Diu, facing Gujarat, is a tidal marsh and saltpans, while the southern coast alternates between limestone cliffs, rocky coves and sandy beaches. This wind beaten and somewhat arid island is filled with quarries built by the Portuguese rulers. The rocky and sandy interior reaches a maximum altitude of 29 meters above sea level, and palms and coconut trees strew this island. It is about 786 km from Daman and is bound by Chasi River on the north and the Arabian Sea on the other three sides. Its total area is about 33 sq. km. and is connected to the mainland by two bridges. Daman is an underdeveloped town, with a tropical flavor and its beaches are very welcoming. It was earlier called by the name of Damao and is bound by the Kolak River on the north. The northern part is called Little Daman or Nani Daman and is filled with restaurants while the southern part is called Moti Daman or Big Daman and is known for its ancient architecture. Both the islands enjoy typically maritime climate. The islands are always welcoming to tourists and throughout the year one can enjoy a pleasant atmosphere. Both these islands are associated with the Portuguese attempts of colonization and one can see its evidence in the rich architecture. These foreign invaders seized Daman in 1531 and formally took it over by 1559 from the last Gujarati king. Attempts to take over Diu had begun from 1531 but the Portuguese were successful only by 1535 taking advantage of the internal conflict of the king and the Mughal emperor, Humayun. After the peace treaty in 1539, the Portuguese took over full control of the island. Both the islands came under Indian rule by as late as 1961. In Daman, one can visit the Fort of St. Jerome at Nani Daman, where there is a Jain temple as well. The 17th-century-old Cathedral and the Church of Lady of Rosary in Moti Daman are also worth a visit, and one can see the exquisite Portuguese carvings on the walls of these churches. Built in ancient Gothic style, these are a feast for the eyes. The stately Light House, the amusement park and the Gandhi Park at Daman jetty are also places of interest. Among the beaches, Devka beach is the most famous. Others include the Jampore beach, which is of interest to the swimmers and is very near the Gujarat border. The lake garden of Satya Nagar Udyan is famous for its fountains and promenades. In Diu, the Zampa Gateway is of particular interest. It has carvings of lions, angels and a priest and has a chapel inside with an inscription dating back to 1702. The artificial Zampa waterfall is also attractive. St. Paul's Church is the only active church till date. Nearby is the old St. Thomas's Church that has now been taken over by the authorities and converted into the Diu Museum. The Church of St. Francis of Assisi has been converted to a hospital. The Marwar memorial commemorates the victory over the Portuguese. The massive fort built in 1541 is now weathered and weak. It is of major tourist interest. Other places include Jallandhar and Gangeshwar temple. 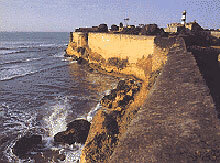 The Nagoa beach is the most famous in Diu. Gomptimata, Chakratirth and the beautiful Sunset Point are the other famous beaches. The Jama Masjid is also famous. The 1000-feet-high hill resort of Saputara near Daman is quite famous. The name means the Abode of Serpents and one can see a holy serpent image on the banks of the river Sarpaganga. To visit Mahal Bardipara Forest Wildlife Sanctuary (60 km) and the Gira Waterfalls (52 km) Saputara is a popular base. Fudam, near Diu town, has a big church dedicated to Our Lady of Remedies. At the western frontiers of the island, Vanakbara has a Church to Our Lady of Mercy, a fort, a lighthouse, and a fishing fleet. Daman is provided with an airport and is connected to Baroda and Mumbai. Only traveler's cheques are exchangeable. The main railhead is Vapi, which is 10 km away. Vapi is about 170 km from Mumbai and 90 km from Surat. For Diu, there are regular air services of Gujarat State Airlines that fly to Mumbai. The nearest railhead is Delwada, 8 km from Diu. It is located between Una and Ghoghla.